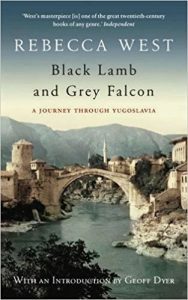 Well, much as I assumed, I didn’t finish Black Lamb and Grey Falcon: A Journey Through Yugoslavia by Rebecca West within the month of August. In fact, I have only read a couple of hundred pages, which might not even have been enough to finish a book of average length. I also only got through the Croatia and Dalmatia sections, with the vast majority of Yugoslavia still awaiting my attention. Though I don’t feel too bad about this. It’s been a busy month and not reading anything like the entirety of BL&GF’s 1100 pages throughout August was in line with the prediction in my preview. And in more positive news, I have enjoyed the book so far more than I expected to. I thought I would be bored much more by BL&GF than I was, and in fact I found West to be terrific company – intelligent, sympathetic (to both her subjects and her reader), reflective without being introspective, and a beautifully creative writer. Her story was brought to life straight away in the opening chapter, when she describes her train journey from Germany into Zagreb, her first stop, with descriptions of her compartment companions that were detailed, but insightful and gently witty rather than laborious and drawn out. They are standing in the rain, and they are all different and they are all the same. They greet us warmly, and in their hearts they cannot greet each other, and they dislike us a little because it is to meet us that they are standing beside their enemies in the rain. I enjoyed the echoes of my own various travels in what was for me, by then, the former Yugoslavia – placenames, and even specific locations such as squares, cathedrals and other notable landmarks in Zagreb or Split that I recall visiting and can see in my mind today. Albeit that the familiarity was ruined slightly by the editing done by Geoff Dyer, whose somewhat unnecessary introduction I criticised in my preview. One of his changes to West’s original text was to anglicise the original placenames, including the Serbo-Croat accented letters. Dyer claims to have done this to make things easier, but it wasn’t so, for two reasons. Firstly, as I found to my delight during my travels (and my short-lived and hopelessly idealistic quest to subsequently teach myself Croatian), the language (or languages – see Wikipedia for the linguistic and political minefield that is Serbo-Croat and its various branches) are beautifully phonetic. Once you’ve learned the letters, the pronunciation, even of words you do not understand, is not a major challenge. The second reason Dyer’s anglicisation didn’t help, at least to me as someone who had visited that region, was that it simply wasn’t a familiar or authentic version of the names. As such, they came over as alien and mangled, unnecessarily and insensitively corrupted – a process that, rather than aiding my immersion into the story, actually separated the names somewhat from the real places West was referring to. For instance, when West describes Ban Jelačić Square, in the centre of Zagreb, a place I remember fondly (and mention in my first book (sorry) and in this blog post), Dyer insists on rendering Jelačić as the pointlessly ugly “Yellatchitch”. I think if I was to recommend this book to someone with an interest in the region (and I would), I’d possibly advise finding an edition of the book with West’s original transliteration rather than Dyer’s unhelpful versions. But moving beyond that and trying to follow West’s original narrative, perhaps the biggest stand out feature of her writing – among many – was the depth of her research. At every turn she has something to tell us about what she sees – from what was to her the recent early 20th century history and the shifting empires of the preceding centuries, all the way back to the Roman era. Sitting as it does in a part of the world where the Italians, Greeks, Ottomans, Hungarians, Austrians and many others have come and gone, and even the British, French and Germans have not been without a role, Croatia is a slither of territory buffeted by various influences and West explores them all. And while I confess to skimming the occasional passage, especially relating to Roman history, there is a value to West’s historical contributions that I didn’t find in, for instance, Rose Macaulay’s lengthy sidetracks. West uses them not as standalone narratives, but as a means to explain the present, the people and places she sees, and even to at times predict the future. Another feature that stands out in her book is similar to her historical exposition, in that she does it at length – dialogue. Now I am a huge fan of dialogue in travel writing. It’s a great way of showing, rather than telling; of letting a person’s words explain their character rather than depending on the author’s descriptions. West does it a lot. She and her husband, who travels with her, meet a lot of interesting people along the way – existing contacts and new – and they are usually fellow intellectuals with plenty to say about politics, arts, history and more. Their elucidations, often over drinks or dinner, are retold at length, paragraph after paragraph that West simply cannot have remembered later on. Perhaps I should describe it more as monologue than dialogue, though some takes the form of passionate debate between two contacts. But due to the extensive nature of the speeches, I am convinced that West either had a notepad to hand at every encounter or, more likely, there is substantial paraphrasing and misremembering at work. It does add value to the story, however, bringing her travels alive with local voices, so I forgive her any inaccuracy, intended or otherwise. And the local voices – or even just passing figures – feature heavily in her book. West is clearly a people person as much as a place person, and she has an unashamed passion for, and even overly romantic view of, the Croatian people. She often lets her imagination run wild by extrapolating thoughts, actions or potential futures for individuals who she briefly glimpses but intensely describes. A great example of this which I had to laugh at – not all in a good way, I am afraid – was so long that I photographed and tweeted it, so forgive me if I just embed the tweet below rather than type out her expansive, almost comical, reflections on a stranger she knows nothing about. I mustn’t mock West for this trait. I find her meandering imagination following fleeting encounters endearing and creative. And there are other things I could more usefully criticise her for. Although her book is clearly a product of its time – Hitler and Mussolini loom in the background of her political narrative and you can almost smell World War 2 round the corner – I do find her occasional racial stereotypes and generalisations a little tiresome. West is good company, though. She’s deeply intellectual, but in an infectiously enthusiastic rather than boastful or self-indulgent way, and you can’t help be inspired and cheered by her keenness to travel, explore and research the country she loves so much. Im keen to keep exploring with her. She’s started in my favourite part of Yugoslavia and the country I spent most time in. But she will go on, I am sure, to be just as good company and just as revealing elsewhere, from bits I know like Kosovo to bits I don’t like inner Serbia. I might not finish BL&GF this year, or even next, but I am determined to do so. When I do I will write a follow-up review and add it to the project’s main page.